Because of the improvements that Mightybytes implemented, our workflow time has been significantly reduced and our volunteers are responding to volunteer opportunity requests far more quickly than ever before. Chicago Greeter is a free service that pairs Chicago visitors with expert volunteers for free guided tours of our city’s neighborhoods. Here’s how Mightybytes created a web-based software solution that simplified the process of facilitating tours, saving the organization time and reducing costs. Chicago Greeter’s existing tour booking and management process consisted of a complicated system of disparate communications: emails, phone calls, forms printed on clipboards, and in some cases even faxes were all used to book and manage tours offered by Chicago Greeter. This cumbersome process took extensive time and multiple resources to manage, which was neither efficient nor cost-effective. Visitors to the city can input data on their upcoming visit and interact with Greeter staff about scheduling their guided tour. Greeter tour guides can interact with staff to manage availability and schedule tours. Greeter staff can facilitate numerous processes to track tour progress, pull reports, and run other administrative tasks. Facilitating communication between visitors and volunteers. Scheduling and assigning additional volunteer opportunities within COTC. Generating reports based on data collected by the software. Over the course of several months, this extensive discovery and experience mapping process led to multiple wireframes of increasing fidelity for key screens in each process. 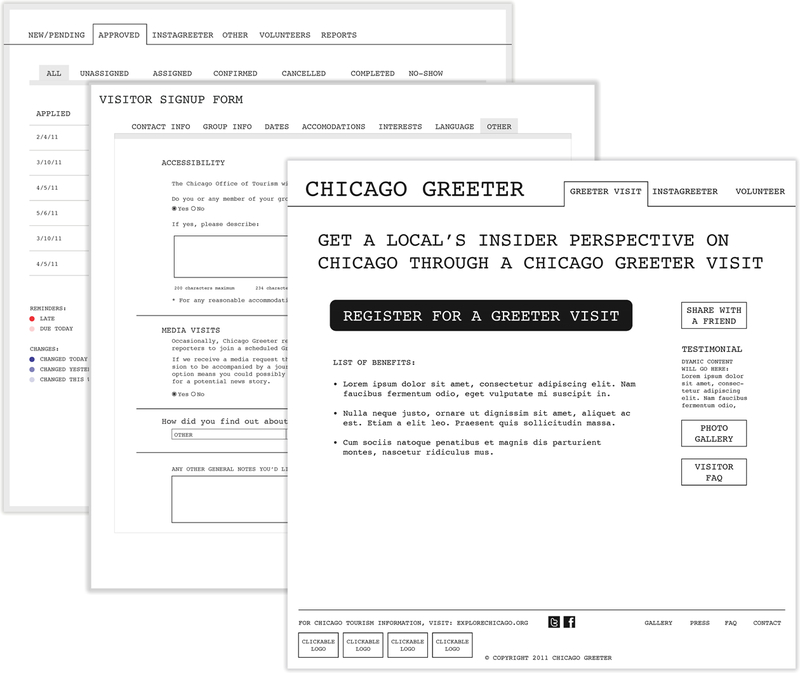 High-fidelity wireframes for key Chicago Greeter interfaces. During discovery, we also weighed various options for development tools—Drupal vs. CodeIgniter, for instance—based on custom features needed to facilitate the aforementioned experiences for each user type. During phase one, we created a public-facing website that helps market the Greeter program and accepts requests from potential visitors. For phase two, we built a new volunteer application that provides tour givers with a dashboard to manage schedules and find new opportunities. In phase three, we married the input from visitor and volunteer actions to create an application for Greeter staff to administer tour details. We built this web application using CodeIgniter and wrote a small framework that allowed porting of data objects between each phase of development. This helped developers integrate the yet-to-be-completed site with existing processes so that the Chicago Greeter team could benefit from updated public-facing portions of their software. With tours being administered in a fraction of the previous time, the new Chicago Greeter system has transformed a convoluted process into a streamlined software experience that can be administered from anywhere, saving a considerable amount of time and money for the organization. View more info or book a tour of your own at the Chicago Greeter site.